My First Virtual Race | I Can Run, So I Will! I completed Oh Baby! Race hosted by Fit 4 Life. Sign up for the race online and print your bib. Enter your data online to complete! It’s great for those that have really busy schedules. Those who want to set personal goals and have an incentive to do it- especially between races. Also, if you are part of a group- you can get people to run together as a small-scale race. I ran a 5K on my own stomping grounds where I run trails every Sunday. 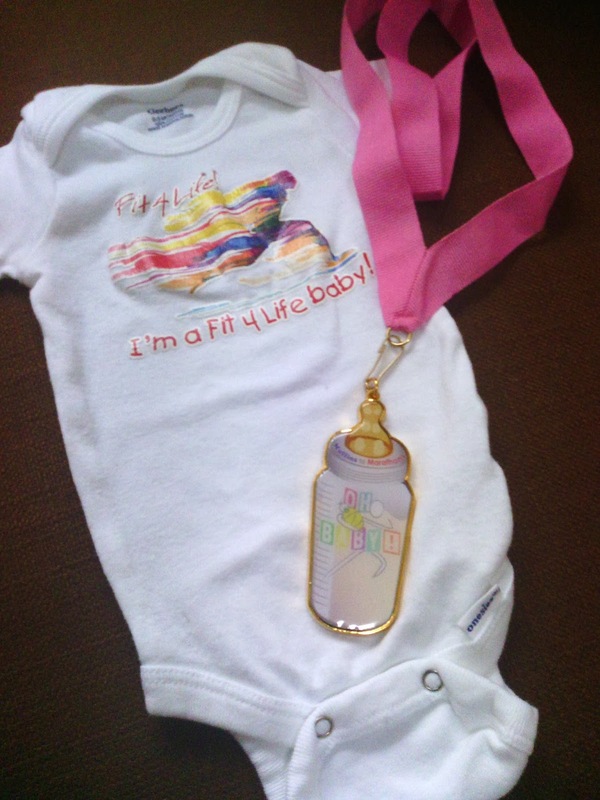 Here is the medal and an adorable onsie they sent for my little running buddy when she comes! A group called Mom’s Run This Town (find a group in your area!) that I am a part of offers two virtual races a year during summer and winter. I am definitely looking forward to running more virtual races!